There is no way of capturing the 3D effect on camera but these cards are da bomb! But then I found out that there was a 3D Tarot out by Lo Scarabeo, based on the Pictorial Key Majors… Oh my, I could wait no longer! This I had to see – not only see but play with! I’m still a kid at heart and in spite of all the high-tech gadgets (or perhaps because of) I sometimes sink into a state of nostalgia for the days when one 3D picture would amaze me no end. I wanted to know if the fascination could be rekindled and there could be no better object for testing this than a 3D Tarot for this Tarotista! 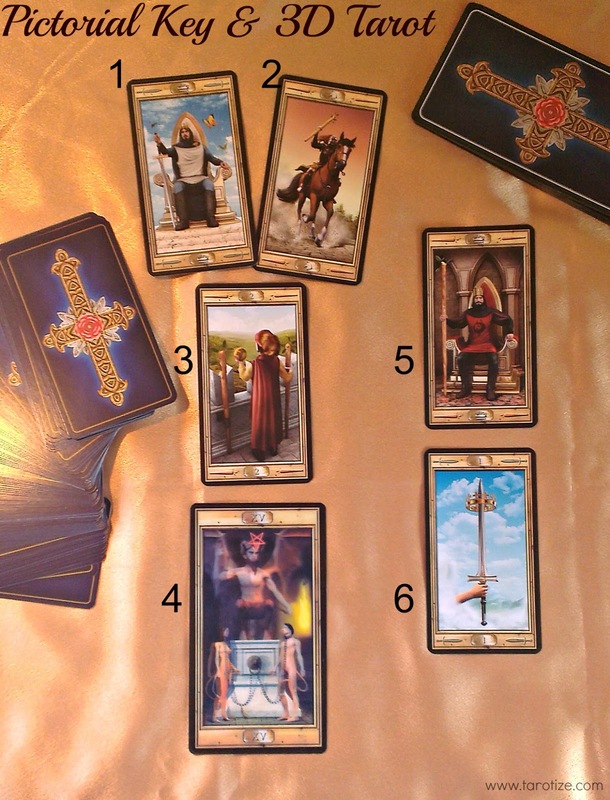 Rather than interviewing these two decks separately, I decided to do the original reading and with the Pictorial Key Tarot and simply replace any of the Majors with one of the larger 3D Majors. This way you get a sense of the size difference. Me: you’re proud of being a smartass? Me: meaning you’re not as smart as him? 3. What gift do you bring? – 2 of WandsPK: a solid yet edgy partnership and two for the price of one. oh wait, you actually paid for both of us… no such luck then! you know, you really should get people to send you more review samples. this is getting expensive! 3D: to be taken seriously and used for shadow work and meditation. oh, and i would take everything the Pictorial Key Tarot says with a pinch of salt. he may be older than me… but I’m bigger and better! PK: lol @ 3D Tarot. I’d prove him wrong here and now if i could be bothered to stoop to his level… pffft… anyhoo, back to the interview: i can provide you with clarity of vision, both for yourself and your clients. Me: yay! Rider Waite clones rock!